Just as you should regularly change the oil in your car or truck or chainsaw, the same should be done for your lawnmower. If you want to have the best looking lawns in the street, you'll need your lawn mower to have a sharp blade and to be filled with the best oil so that while you are pushing the damn, thing, the engine operates well. You could be tempted to think of your lawn mower tas being 'just a lawnmower' so any kind of auto oil will do but that could mean the difference between extending the life of your lawn mower or causing it to clog and become inoperable. So if you want the 'good oil' on what to put in your grasscutter, read on. What kind of oil do I need to use in my lawnmower? The temperature of the climate in which you will operate the lawnmower will have an influence on your oil needs. Lawnmower engine experts Briggs and Stratton advise that "Engines on most outdoor power equipment operate well with 5W30 Synthetic oil. 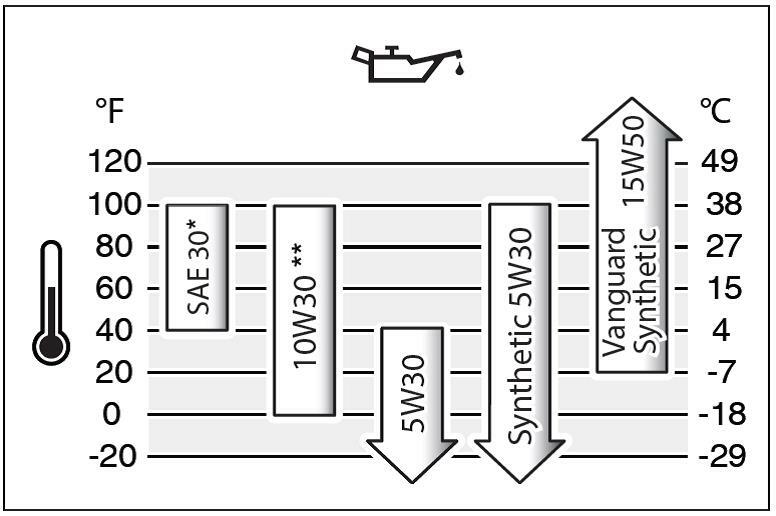 For equipment operated in hot temperatures, Vanguard 15W50 Synthetic oil provides the best protection." What that means for you as the oil user is that you need to check what range your engine will run on. The easiest way to do this is to check your engine's user manual for the manufacturer's recommendation. If you have lost the manual or never had one, then use a search engine to find a PDF of it. A general rule of thumb though is that engines on most outdoor power equipment operate well with 5W30 Synthetic oil. Once you have found the right kind of oil, it's now time to consider what brand of oil you want to use. Cheap and cheerful or bespoke oil made for exact kind of engine? We typically recommend you avoid the cheapest range of any tool or safety gear or oil and most certainly do the same with lawnmower oil - we suggest you used tried and trusted brands - because these oils have been road tested in many machines being pushed many thousands of miles. If those brands didn't cut it, they wouldn't survive in the market. If you don't believe me, read this tale of how Slitz turned a quality beer into a joke and ran their brand into the ground. One rule of thumb to bear in mind is that the older your engine is, the more likely that it will suit the traditional SAE30 oil ranges. If you want tried, trusted and true, Briggs and Stratton oil is for you. Briggs and Stratton is arguably the biggest named player in the lawnmower engine market. Their engines are known for 'going and going' so much so that other big name brands simply use the Briggs and Stratton engine on their own branded machines as a selling point. So, the biggest name in lawnmower technology is sure to have a quality oil product for their machines and their version of 30W for small engines is most likely what your engine would benefit from. "Bought a brand new lawnmower, and didn't want hubs to blow this one up too because he forgot to put oil in it." Classic and it's always worth a reminder that if buying a new lawnmower, you need to add oil before you use it or you will destroy the engine. Order some oil on Amazon. How often should I replace my lawnmower oil? Many car owners change their car's oil once a year as part of an annual tune-up up. It lengthens the life of the engine as its parts are protected from wear. For smaller engines, the comparison is the same - many lawn mowers will change their oil once a year in the spring when the grass starts to grow long and the mower is used more regularly. This is tied into the use of the mower - your mower can have varying needs depending on use hours. A lawn that's mown for half an hour once a month, may only need a change once a year but a weekly mower of a larger lawn may require two changes. A ride on mower is probably more likely to benefit from a change at 100 hours of run time and annually. If you feel your engine isn't performing well, a change may help. As we always recommend, your user instruction manual should be able to give you advice - and it will be good advice too because the dudes and dudettes who made the engine have tested it to the ground in the lab so they will know how their machine works under so many conditions. 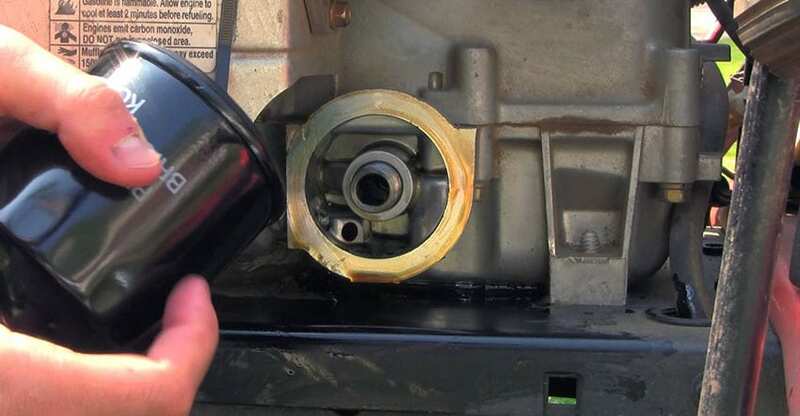 When it comes to changing lawn mower oil, there are certainly a few tips and tricks that you can do to make sure you have an oil splash free transfer. So now you've understood the reasons why you need to regularly change your engine's oil, the next question might be how! The first thing to do is consider the location where you will drain the oil already inside the mower. Naturally, you'll want to avoid doing this operation on your grass lawn or near your garden in case of spillage. To that end, concrete surface such as a driveway is ideal. You'll, of course, want to lay down newspaper or cardboard to catch any oil drops that may collect to avoid staining the concrete. It is best to have turned the lawnmower's engine over for a few minutes before you drain the oil. This is because particles that have collected will be floating around in the old oil. Take care that when draining the oil that the engine parts are not too hot - you may need to use gloves if you have run the engine for a while. It's also now time to disconnect the spark plug to prevent any accidental ignition of the engine. Clean the general area with an old cloth to prevent any external debris from falling into the crankcase when you open the drain plug. Tilt the mower deck and then position some newspaper and an oil pan or jug beneath the mower. Then take a socket wrench to run the plug counterclockwise. This allows the oil to drain into your collection device. Once the oil has fully drained, secure the drain plug by twisting clockwise and tightening gently with the wrench. If your mower has an oil filter, its the opportune time to replace it as well. If your preference is to siphon via the oil entry point rather than drain, a siphon kit might be just the ticket. Once you have your siphon at the ready, place one end of its tube into the oil fill hole and make sure it has reached the bottom of the reservoir. The other end of the tubing needs to be placed into a container that will not knock over during the process. Engage your siphon and do your best to empty as much of the used oil as you can. Tilting the engine on its side slightly can help pool the last of the oil and the tube can be manipulated into a position to collect the last of the oil. 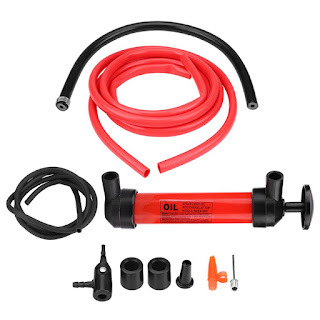 These kits can also be used to transfer fuel from your car or fuel container directly into the lawn mower's fuel pump. A handy way to make an efficient transfer! Once you have completed the siphoning, you are ready to add some new oil. And what could you use? 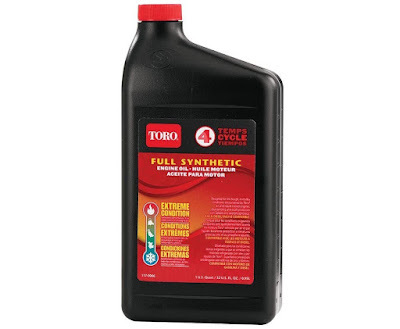 How about Toro Synthetic oil? Designed to work across a range of extreme conditions, Toro synthetic oil will handle the heat and the cold to help you get your lawns cut. It will work especially well with new model mowers that are designed to work with this type of oil. Toro is a massive brand worldwide, in addition, to push lawn mowers they produce golf cars, ride on mowers, spray equipment, diggers, bunk rakes, and top dressers. So they know engines and they know oil so you can be sure the oil its engineered and tested to meet the needs of their machines. This means due to its quality, Toro oil will do most lawn mowers a favor in terms of performance. It certainly meets the performance requirements of brands such as Briggs & Stratton, Kohler, Honda, Tecumseh and Craftsman! Check out the price on Amazon. So you've got your oil, it's now time to add it to the engine. This is the easy part of lawn mower maintenance! Open the oil dipstick and remove it and check that you do actually need oil! If the reservoir is empty, add the manufacturer's recommended amount. You can pour the oil directly from the container or use a plastic funnel (or one you have fashioned from some scrap paper). If you make a mess, wipe the oil up with an old rag or paper towel. Screw the dipstick back in place and run the engine for 30 seconds so the oil can get around the engine's internal parts. Unscrew the dipstick again so you can check the level - hopefully, the oil is bang on the 'full' line. If you have underfilled, top up. If you have grossly overfilled you may wish to remove some oil. Nice work, you've replaced your engine oil. How much oil should I add to the lawn mower? Lawn mowers come in varying sizes but generally speaking, you can break them down into two sizes, walk behind mowers or ride on. For walk-behind mowers, the oil capacity is about 15oz or 18oz. Riding mowers tend to have an oil capacity of around 48oz or 64 oz. As we need to keep stating, the exact amount for your engine will be found in the user manual and if you don't have it do hand, google it - they often can be found in a PDF format at the manufacturer's website. What happens if I add too much oil? Too much oil in the sump can be too much for the engine to handle. It might start to burn white or gray smoke. If you see this happening, it's time to change the oil. Drain it and then add the correct amount. Too much oil can also prevent the engine from starting properly and there is nothing more frustrating on a Sunday afternoon if you can start your mower, especially if you are the cause! An excess of oil can also potentially mean that it gets aerated and thus it's performance declines. You can check if you have too much oil but using the dip stick. If the oil is over the full line, you'll need to remove some oil. If you have collected the used lawn mower oil, please do not dump it down the drain or garbage bin. For the sake of the environment, there are plenty of places that will take your old oil. Many services centers, dealerships and gas stations will do this. Some mechanics do so as well for the 'locals'. Can I use synthetic oil in my lawnmower? Yes, you can use synthetic oil in a lawnmower. Oils like Amsoil are designed for more modern engines. Synthetic oil is a small engine lubricant full of chemical compounds that are artificially made using chemically modified petroleum components. The benefit of using synthetic oil is they tend to offer better viscosity, wear and deposit control and low-temperature fluidity. This means that if you regularly use synthetic oil in your lawnmower (over the long term) then you greatly increase the chances of long service life and reduce the need to replace your lawnmower at year 6 instead of year 10 (excuse the hyperbole!). So the regular use of synthetic oils in your engine reduces the chances of it failing and thus in the process, extends its service life. The only real downside to using this kind of oil is that it is usually priced significantly higher than standard oils. 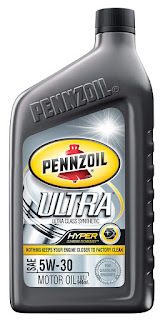 Check out this example from Pennzoil for example, their 530-30 Full Synthetic can price over 50 bucks! Is lawnmower oil the same as car / auto oil? You might be eyeing up that bottle of Castrol car oil you have in your shed with an eye to adding it to your lawn mower as it could save you a trip to the hardware store. So can you use motor oil? Technically speaking, yes. Four stroke small engines can use car oil. However, motor oil is generally designed for the hot and heavy conditions of a car that will be driven for long periods. 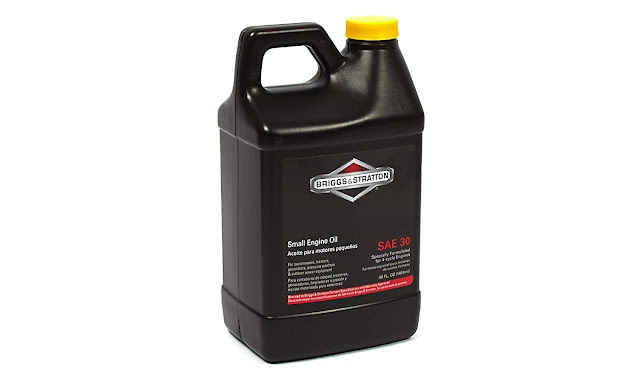 A smaller engine will benefit from oil that is designed for it - this is why most brands and manufacturers recommend oils like Toro or Briggs and Stratton's version of SAE 30W. If you have a two stroke engine, then you must absolutely only add two stroke oil to the fuel. Two-cycle motors simply cannot use motor oil. You'll also be wise to not use oil designed for big engine / heavy duty machines for small engines - you probably do not may have a viscosity that could actually cause a clog or even disable your unit. Can I use 10w40 oil in my lawn mower engine? 10w40 can be used in a small engine and most users do not report an increase in consumption. It's related to the viscosity of the oil and manner it will operate in cold or hot temperatures. How to change a lawn mower oil filter? If your lawnmower has an oil filter, you will need to change this once in a while so that it can continue to do its job of helping to keep your engine oil clean and free of gunk. Once you have selected the correct filter for your engine (OEM or branded) follow these steps. Locate the oil filter and twist it counter clockwise until the oil filter can be removed. If you cannot free it with your hands, you can use a pipe wrench or filter wrench. Observe if there is dirt or other debris on the seal and clean it off with a rag (we love old towels for this). 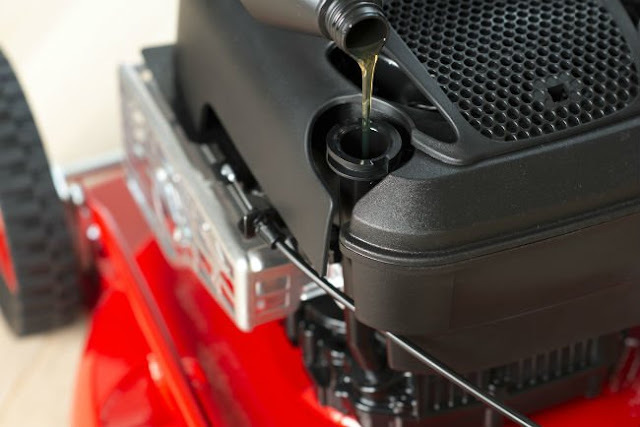 Take your fresh engine oil, rub the clean sealing gasket with oil so that it appears clean and well-lubricated. Take your new filter, remove it from the packaging and place it into the filter adapter and gently screw in by hand. When you feel its snugly in, tighten it firmly with a wrench but do not over tighten it as you could cause some damage. If you have a two stroke lawn mower then you are going to do things a lot differently than as described. You will need to add the oil directly to the gas, just the same as you would a petrol chainsaw. When fueling your lawn mower, you'll need to add the correct two stroke oil in the correct ratio to the fuel, before you add the mixture to the engine. How much to oil add to the petrol? As always follow the manufacturer's instructions. I've got a brand new lawn mower, what do I do with the oil? one), it will not have oil in it and if you run it without, you will break your engines internal working parts in pretty good time! So, get some oil and get it in. Run the engine, check the level is filled properly and go cut some grass!